To observe and identify birds in their natural surroundings. One, who at the mere hint of a rarity will drop everything to travel hundreds or thousands of miles to go see it! When people ask me how long I've been a birder I guess I'd have to say my whole life. From a very young age living in the UK I just loved to watch the birds & place food out for them, both at home and school! When I was in my teens I joined my local birding club, a chapter of the RSPB Royal Society for Protection of Birds, and started going out on regular field trips. I still do the same to this day although I now live here in the States and my love of birds has only increased with time. No matter what age you are or what level of experience, birding can be such an enjoyable hobby and there are many birding clubs and organizations out there to help you on your way. It brings people from all walks of life together and is a wonderful way to meet interesting people, make new friends, get you out into the fresh air and escape from life's pressures. Below is a page on birding resources containing lots of bird related links and to which I am always adding. You may either scroll down through them all or click on the catagories at the top of the page to jump to that section. I like to go on field trips occasionaly, both locally and out of state and have posted a summary with photos for some of them which can be found on my Bird Trips Page below. Probably one of the most important things I own - My Binoculars! I take them everywhere I go. These ones are the Nikon Venturer LX 10x42 roof prism, waterproof binoculars. They are extremely bright and sharp and although heavier than many others I use them on a halter type strap which moves the weight off of my neck onto my shoulders which allows me to wear them comfortably all day with no problems at all. I wouldn't trade them for the world! An extra pair of small compact binoculars are kept in the car just as a backup or in case hubby wishes to use them! I also have a very small spotting scope made by Kowa (TS-501, 20x40, 50mm) which is very useful for traveling and hiking as it fits into my backpack being only 9.6" in length and weighing only 14.8oz! Of course being so compact the optical quality is not the same as the "big boys" which are certainly worth the investment, but it certainly is useful when hiking down some longer trails where the bigger scopes start to get heavy, or when I'm just birding by myself. It allows me to see twice as close as my binoculars and then some. Choosing binoculars is a very personal thing. Everyone sees differently and has their own preferences. Some like 8x for ease of finding a bird when in woodland settings or when birding on pelagic trips (out at sea), others prefer 10x for a closer view. Whatever you prefer, when looking for binoculars take your time and try out as many different kinds as you can. The same goes for spotting scopes. Below are some links that show the many types of binoculars and spotting scopes available. The present "Referance Standard" for binoculars can be seen at BVD (Better View Desired) web site below. They do change, and mine to the left here were the BVD ref. standard at one point. I still love my Nikons but now there are lighter versions and some excellent options! Better View Desired A great online resource with all the latest reviews. Eagle Optics Another great selection of optics. 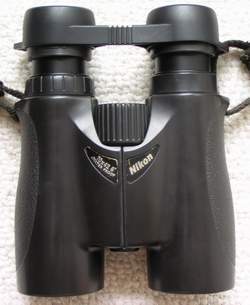 10x42 Nikon Venturer LX Superior E Binoculars. Joining the local Chapter in your area is a great way to get to know other birders and to join in some of the various field trips offered both in and out of state. Trips are held several times during the month depending on the chapter and in most cases local meeting places are arranged before heading on to the birding destination. Everyone is encouraged to car pool on these trips which helps keep the car numbers in a caravan down to a minimum as well as being a good way to get to know other birders & make new friends. Some good local birding spots in the Dallas / Fort Worth Metroplex include Village Creek Drying Beds, Cement Creek, River Legacy Park, Fort Worth Nature Center, Haggerman NWR, Lake Tawokoni, Grapevine Lake and Colleyville Nature Center. The National Audubon Society Find your local chapter here. Audubon Dallas Dallas Audubon Chapter website. 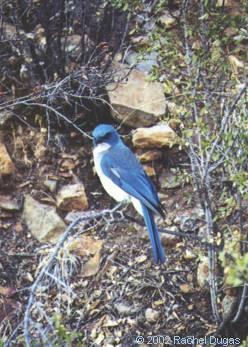 Mexican Jay in Big Bend National Park along the hike to Boot Canyon. Is the coffee you drink destroying rainforests and the birds that call it their home? Well, by purchasing "Shade Grown" coffee you will be helping to save thousands of acres of tropical rainforest as well as the migratory birds that winter there each year. Sun grown coffee requires enormous amounts of pesticides and fertilizers and clear-cuts the rainforest habitat which native birds & our migratory North American birds depend on. In contrast, shade grown coffee is organically grown as fertilizers and pesticides are not needed due to the balanced ecosystem which remains intact. The coffee tastes exactly the same if not better and although it may cost a few pennies more per cup, those costs go directly to the local farmers & the forests and wildlife remain preserved. It comes in all the same varieties as sun grown coffee ~ Caffeinated, Decaffe, Expresso blends and flavours such as Hazelnut and Vanilla. So next time you go to buy coffee, remember that you can make a real difference with the choice you make. Below are several links where you can purchase Shade grown coffee and learn more about the process. Article about the Songbird Foundation Project, by company director - Danny O'Keefe. A huge selection of shade grown coffees & a "coffee club". A report on Songbird death linked to coffee habits of Americans. Vineyards that use Natural cork to seal their bottles which can help preserve wildlife and birds in the Mediterranean regions of Europe by growing forests of the "Cork Oak" from which cork is produced. There is a fear that the increasing use of synthetic corks could be a threat to these forest habitats by decreasing the demand for natural cork. Selecting wines with natural cork could help preserve the cork forests and wildlife that live there. Pine Warbler - 2/17/07, #104. Orchard Oriole - 5/7/07, #106. Red-shouldered Hawk - 5/11/07, #107. Swainson's Hawk - 5/11/07, #108. Click here to see the Species List of all the birds seen in my garden.